*Guide for Math TAs: Our department's very own informal guide to teaching in Van Vleck. Biggest guideline: stay close to campus or a busline (don't plan to park on campus). You will receive a free bus pass for the [http://www.mymetrobus.com/ Madison Metro] system, which is very reliable. Check out the “plan your trip” link to find bus routes near you. 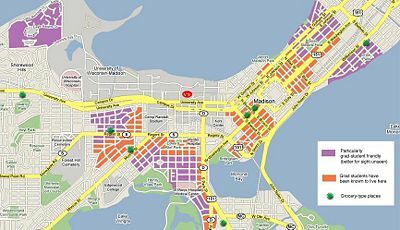 Basically, shoot for zones 4 and 6 on [http://housing.civc.wisc.edu/map_all.asp this map] (the map from the UW Off-Campus Housing Search). *Head down State Street to the Capitol and explore the Capitol building and surrounding shops. *You can also go walking around the [http://uwarboretum.org/ Arboretum] south of campus and tour their gardens, or head to the free [http://www.vilaszoo.org/ Vilas Zoo]. *[http://www.eagleheightsgardens.org/ Eagle Heights Community Garden]: open to both residents and non-residents alike for a small fee. A great place for a stroll if you live in Eagle Heights. 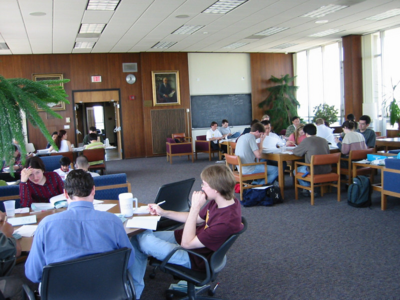 *Go to the Gym: [http://www.recsports.wisc.edu/ Rec Sports] runs the gyms on campus. There are three such on-campus gyms -- The SERF, the Nat, and the Shell, which are free with student ID. For $10/semester, you can attend any of their Group Fitness classes, which cover everything from aerobics and weights to yoga and dance. Also, both the SERF and Nat have indoor pools. *See a Game: As a student, you can get tickets to [http://www.uwbadgers.com/ UW athletic events]. There are at least a few people in the department with season tickets for football at Camp Randall. You can also look into season tickets, and sometimes individual tickets, for basketball, hockey, etc. For a less-commitment, still awesome game, try the UW women's hockey team-- they are 3-time national champions, and home student tickets are $2. More of a stay inside kinda day? In addition to the many [http://www.library.wisc.edu/ Libraries of UW], the [http://www.madisonpubliclibrary.org/ Madison Public Library] (main branch located on the square, others around, including Monroe St) is a great place for books, movies, and music. *Eastgate and Point are the more standard theaters, Eastgate being the larger. *Star Cinema, south of Madison in Fitchburg, also plays the standard stuff, but just got an IMAX theater put in and generally has the newest facilities in the area. *The Orpheum and Westgate all show less mainstream movies... everything from low-budget documentaries (more the Orpheum's style) to high-budget social commentaries (more seen at Westgate). As a note, the [http://cinematreasures.org/theater/233/ Orpheum] is also a good place to catch live performances. *Sundance 608 is new to town, and also has a good selection of independent films, as well as a cafe, 2 bars (you can take a drink into your movie), and a restaurant! Very swank. *There are several different programs that run through the Union. Keep an eye out for occasional free sneak previews. Plus, the [http://cinema.wisc.edu/ UW Cinema Studies] department over in Vilas Hall has their own screening room. They run the UW Cinematheque. Keep an eye out for special events - the department has several links to Hollywood and foreign consulates, so they have the ability to bring in stuff that is very difficult to access otherwise. *There is also a Math Department movie night in VV, currently on Wednesdays, that shows usually artistic, foreign, or otherwise interesting films. *In late March/early April, go check out some of the many many films showing at the Wisconsin Film Festival. Once a semester, our group for [http://www.math.wisc.edu/~wimaw/ women in mathematics] get together for an informal potluck. We also have been known to bring in women speakers funded by the [http://www.math.wisc.edu/VIGRE/ VIGRE] and [http://wiseli.engr.wisc.edu/ WiSELI] grants.